As I mentioned before, we are in a breakfast rut. So, last night I decided to make some muffins for a change of pace. I don't really have a go to muffin mix, so I asked Google to give me some. I found THIS one after a short search. It is a quick and easy recipe. The hardest part was chopping the frozen cherries. The recipe states it makes 12 to 15, but I only got 10, I may have made them to big. We both tried one for breakfast. I found them bland, I think they need a little nutmeg or something. I will keep that in mind for the next time. Little Miss loved them! I have been occasionally giving cherries as a breakfast treat, and she seems to really like them. 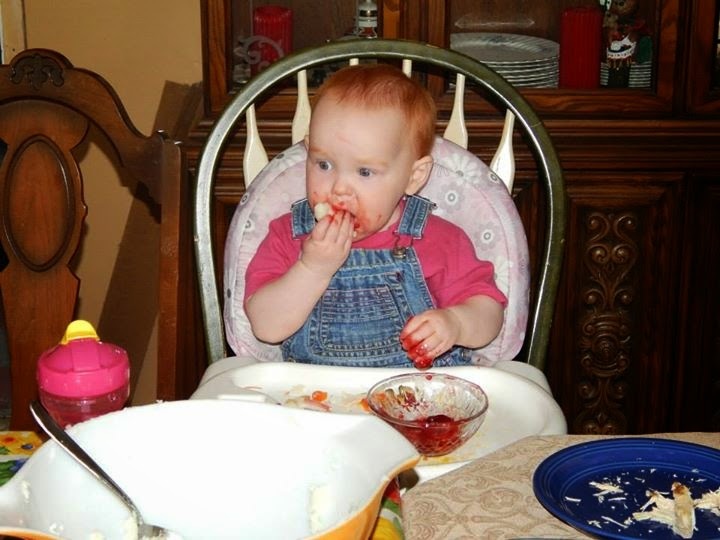 So, at Easter dinner, we decided to give her a tiny piece of cherry pie. The recipe is a really good one, I saved it so I can go back to it again. I think next time I will use a different fruit and maybe add a little spice. For now, they are toddler approved and make a great breakfast option! I have the same problem with a lot of my toddler recipes - they end up too bland for my liking, but my son loves them! I read somewhere though that to kids, food has a stronger taste. I don't remember exactly why though. I suppose it makes sense that they like things with milder flavors then.